Cactus pear (Opuntia spp.) belongs to the family Cactaceae which is composed of about 130 genera and 2000 species. It is native to the tropical and subtropical regions of America but can be found in different regions of the world with various climate conditions. The fruit is an ovoid-spherical berry that, at maturity, may vary in color. Opuntia ficus indica is the most economically important and widely cultivated species of this genus. Cactus pear is an economically and ecologically important crop with various uses. It is cultivated for human consumption since its fruits are rich in carbohydrates, vitamins, proteins, minerals and antioxidants and have anti-cancer, anti-inflammatory, anti-viral, anti-diabetic and neuroprotective properties. The juice is rich in glucose and fructose and has a potent antioxidant activity. The cladodes of some species are edible as vegetables in salads. They are also used to feed cattle in arid and semiarid lands. The plants are well adapted to drought, high temperatures and low water availability and are able to absorb and hold CO2 excess from the atmosphere. Cactus pear is mainly propagated by cladodes. The breeding programs of this genus aim at the development of spineless cultivars with cold tolerance, high yield and fruit quality, and resistance to diseases and pests. To date, biotechnological tools have been scarcely used for cactus pear improvement. 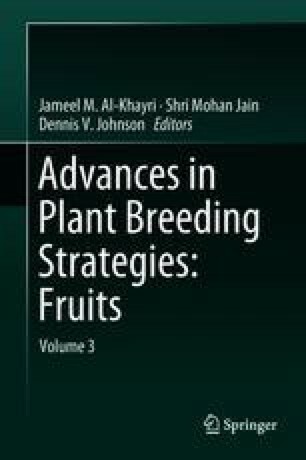 In the present chapter, the main problems, challenges, strategies and objectives of cactus pear breeding are described, and the recent achievements in terms of biotechnology and molecular biology are reported. Biotechnology Breeding Characterization Fruit Opuntia spp.